Mahjong Time is excited to host the best multi-table online mahjong tournament and single table mahjong challenge anywhere on the Internet! Whether you are playing the Hong Kong, Chinese Official, Riichi Competition Mahjong Modern or American rules, you'll find exciting challenges as you advance from round to round for a chance to win the grand prize! Build your winning hands quickly in a fast-paced single elimination tournament format or go for the biggest hands and points in multiple-round format. The choice is yours! These are tournaments that start at a specified time. To participate, you must register before the registration closes. Registration closing time may vary from tournament to tournament, ranges from few minutes to half an hour before the tournament's starting time. These are the tournaments that start as soon as a specified number of players are seated at the tournament table. 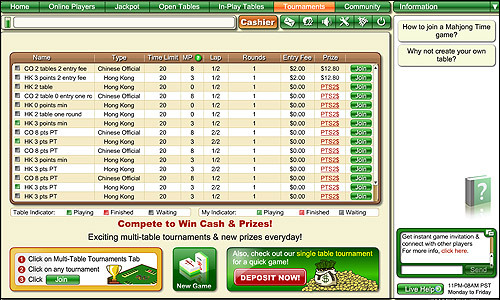 In addition, compete in our single table mahjong challenge to qualify for the progressive prize. Get the highest points to walk away with the Jackpot!